The US-backed, Kurdish-led Syrian Democratic Forces claim they have captured Raqqa’s Old City from the Islamic State, but some observers said fighting continues in the area. The SDF, which began the assault on the city in early June but had been held up for weeks after breaching the Old City walls, said on Friday that the takeover was complete. The SDF are making great progress around the city centre and throughout Raqqa and gain more ground every day. The SDF are the best source for operational updates on their progress in the fight to defeat ISIS in Raqqa. Raqqa has been the central position of the Islamic State in Syria since 2014. With its loss and ISIS retreats before multiple attacks elsewhere — by the SDF, led by the Kurdish militia YPG; by pro-Assad forces; and by rebels — the group will now be largely based in Deir ez-Zor Province in eastern Syria. Meanwhile, an Islamic State convoy of more than 600 fighters and relatives is still stranded, after its path to Deir ez-Zor was blocked by US warplanes. The convoy of buses and ambulances set off on Monday from southwestern Syria, after ISIS was removed by positions on both sides of the Syria-Lebanon border by linked offensives of Hezbollah and of the Lebanese Army. Two days later, the US carried out airstrikes to crater roads and attacked individual ISIS vehicles trying to reach the convoy. The Assad regime’s military insisted that a route is still being sought for the convoy, now near Sukhna in eastern Homs Province, to reach al-Bukamal close to the Iraq border. 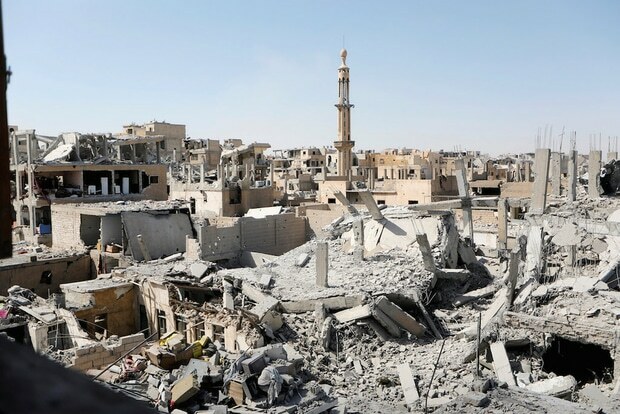 UN envoy Staffan de Mistura said that he expects ISIS’s defeat in Raqqa and in Deir ez-Zor Province by the end of October. , with elections to follow with a year to establish a political resolution. After Raqqa and Deir ez-Zor – and that is a matter of a few months – there will be a moment of truth. If the international community helps both the opposition and the government by pushing [them] to accept a real negotiation, then within a year it would be a possibility of having a truly credible election…. Do we want to reconstruct Syria and who will be paying for it? Only an inclusive, political, credible solution will allow that reconstruction and that will be through elections. He again called on the main Syrian opposition to accept union with smaller factions, backed by Russia, so negotiations can proceed. The envoy is hoping to reconvene two weeks of political talks in Geneva in October.